Are you getting enough light? SunSprite can tell you. After studying dozens of clinical studies showing bright light can help boost energy, positively impact your mood, and reset Circadian Rhythms for improved sleep patterns, Harvard trained doctors and engineers, Jacqueline Olds, Richard Schwartz, Thomas Hayes, and Kasey Russell teamed up to invent SunSprite—a wearable device that tracks your daily light and sun exposure. Made in the USA, SunSprite measures both visible and UV light so you can soak up just the right amount of the sun’s health benefits through your eyes without over exposing yourself to harmful UV rays. If it’s bright enough, you only need 30 minutes of light per day and you don’t even have to go outside to get it. Small lifestyle changes like eating your breakfast or reading the paper facing a sunny window can make a difference. SunSprite is flexible, magnetic, works on any material, and doesn’t leave marks. Its mobile app lets you track your progress, get scientific coaching based on your schedule, view historical data, and more. Solar powered and Bluetooth enabled, SunSprite syncs wirelessly to your mobile phone. Sunnier disposition possible. No batteries and no cords necessary. 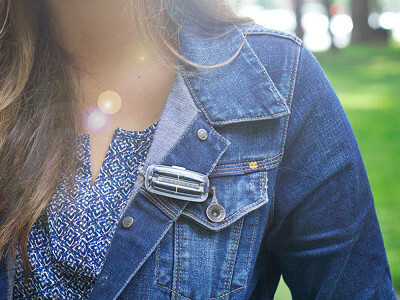 Hi Grommet -- We're excited to share with you SunSprite, a wearable light tracker invented by doctors. SunSprite is small, 100% solar-powered, and syncs to an easy-to-use mobile app based on decades of scientific research. As fall approaches (with winter close behind), SunSprite will help you make sure you're getting enough sunlight, which is important for setting your body's circadian rhythm and improving your energy and sleep. We believe in a brighter, healthier world. I'm here to answer any questions you may have! Oh, so is this like a fitbit for the sun? Very clever. I own a happy lamp that I use in the winter time to feel better. Does Sunsprite work with artificial light or does it only track pure sunlight? @Suzanne Thank you for the question! Yes, SunSprite accurately tracks light boxes. The most concentrated bright light comes from the sun; however, using light boxes can be a great way to supplement your daily intake (as we know, since we live in Boston and it gets dark here in the winter). SunSprite also increases your light box’s overall effectiveness by measuring how much bright light you’re getting from your light box, accounting for its intensity, effectiveness, and distance to your eyes (suffice it to say, not all light boxes are the same). 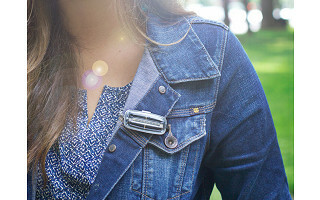 Basically, whether it’s from a light box or the sun, SunSprite makes it easy to track your daily bright light exposure. I see in the product details that SunSprite tracks both "bright light" and "UV." Is there a difference between the two? I thought it was all just sunlight. @Ken This is a good point. Sunlight contains both UV and "bright light". UV is invisible, and when it hits your skin it generates vitamin D and, if you get too much, causes sunburn. The part of sunlight you can see (which is called "bright light") is what sets your circadian rhythm so you can sleep better and feel more alert and happy. SunSprite tracks both types of light so you can get enough bright light to be happy and healthy while avoiding high UV intensities. Seeing you on here is just the little nudge I needed—I just snagged another one for her. I've loved my first few weeks with it, and the one tiny issue I had when I first started it up was immediately addressed by your lightning-fast customer service team, who helpfully guided me toward brighter light (which, I suppose, is pretty fitting). Here's to your continued success—it's such a kick seeing you on here! Go, SunSprite! @Lindsay Thank you very much! We're really excited to join all of the amazing products that launch on The Grommet. What a great idea! Traveling to other parts of the U.S. and Canada where the weather is overcast a lot of the time, I always observed people were less friendly or moody. I bet this makes a great difference! @Deidre Thank you for your comment! Our mission is a moody-free world. ;-) We've already heard from a lot of our SunSprite community that this small product is making a big difference in their lives -- everyone from kids to grandparents! Great idea! I'm really interested in buying this for my elderly mother who suffers from insomnia and mild depression. Is the "coaching" app easy to understand? I don't want to introduce another technology problem. Also, what if she misses a day with the device, does that affect the tracking? Is the gadget easy to connect to clothing especially for a person with reduced flexibility? I might have missed that detail. Thanks for advancing a non-drug solutions to this big health concern!! @Gail Hi Gail, sounds like a great application to us! We've had dozens if not hundreds of "non-techies" purchase and use a SunSprite, and one thing we hear over and over again is how easy it is to use. @Gail - If she misses a day syncing the device, no problem! Your SunSprite actually stores a full two weeks of data without needing to rely on the app. So if you go on a camping trip and want to leave your smartphone at home, SunSprite can still track all of your daily bright light without missing a beat. Thank you for your kind words and supporting our mission! Are you getting enough light? SunSprite can tell you. After studying dozens of clinical studies showing bright light can help boost energy, positively impact your mood, and reset Circadian Rhythms for improved sleep patterns, Harvard trained doctors and engineers, Jacqueline Olds, Richard Schwartz, Thomas Hayes, and Kasey Russell teamed up to invent SunSprite—a wearable device that tracks your daily light and sun exposure. Made in the USA, SunSprite measures both visible and UV light so you can soak up just the right amount of the sun’s health benefits through your eyes without over exposing yourself to harmful UV rays. If it’s bright enough, you only need 30 minutes of light per day and you don’t even have to go outside to get it. Small lifestyle changes like eating your breakfast or reading the paper facing a sunny window can make a difference.